And much, much more, including a wealth of time saving shortcuts, indispensable insights and essential bug workarounds. Whether you are an intermediate user looking for much needed inspiration or a beginner needing a solid grounding in MPC workflow techniques, the MPC Touch Bible will expertly guide you through every step of your into journey into becoming an MPC master! Available to download instantly after purchase. 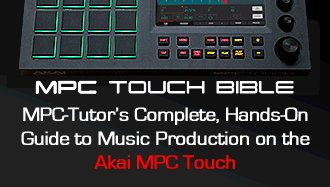 Find out more about the MPC Touch Bible! I really like the book. It is easy to read and comes with some really nice example files to get even an MPC novice right in there learning while having fun. That said, I was a little dissapointed to find that there is no Index and although it seams like all the parts are there, the TOC is just about useless for for finding what you need quickly. I didn’t go through every section yet but it clearly needs an update as almost everything is on a page other that thwe TOC says. Most what I tried to look up was way off so it is not as good a desk reference as it could be. Please let me know if you ever get around to fixing it. Otherwise it is very informative and is helping to fill in the gaps in my knowledge. Thanks for pointing out the problem with the TOC at the front of the book, I’ve fixed that so all the page numbers in the ‘table of contents’ are now correct, please just re-download from the original link I sent you. Regarding an index at the back of the book – an index is really something that was necessary in a paper book; with digital books it’s much more efficient to use the built in ‘search’ function of your PDF reader. Most applications like Preview and Acrobat have a search box at the top right of the screen, or you can use the shortcut ‘CMD & F’ (Mac) or ‘CTRL & F’ (PC). Just enter the word or phrase you are looking for and your PDF reader will immediately present you with a list of results that you can click to take you directly to the relevant page(s) in the book – it’s basically an ‘on-the-fly’ index tailored to your search term. There’s a similar feature in all the popular ebook readers such as Kindle, Kobo and iBooks etc. Does the MPC Bible come with tutorials for updated MPC Software?